So it may not be the most blurry picture in the world, but in comparison to some other leaked shots we have seen this is definitely the work of Mr. Blurry Cam. We know you love it anyways. What we have to look at today is a full frontal shot (as opposed to just a tease) of the upcoming HTC Ruby. The Ruby is believed to be a mid range Android device, but I won’t complain about HTC hardware. ← Is This The Samsung Hercules, 4.5″ Of Android Dual-Core Awesomeness? Haha name could of been Gilligan! Nah looks more like MT4G with cap. buttons. I can understand now why some companies wouldn’t want to degrade their brand image by introducing low end offerings. I don’t think phones like this help android. In so many recent polls show that upwards of 50% of android users will switch to the next iphone. Google has only themselves to blame for this user apathy. Google seems to want to be the walmart of OS’s where quantity is more important than quality. I agree with you completely. However, given the shape of the speaker bar, I would think this is the follow-up to the MT4G, making it top end of mid-range at least. I agree with you completely on the lower-end phones (wildfire S, gravity smart, etc.) though. I know they move a lot of units, but whether that is “good” for the Android OS is separate issue from sales. If this is the next MT4G, Pleeeeease make it in Khaki so I can use it at the zoo. Me personally, I will always stick with the Android phones. I started with the G1 and then MT4G and now I have the Sensation. If someone gave me an iPhone I would use it for a doorstop or sell it as soon as I could. I can’t see paying that kind of money for the damned Apple name. ANDROID ALL THE WAY!!!!!!!!! You are so full of crap. For one Google ONLY makes the Nexus line of android. Google allows other manufacturers to use the OS and modify it so it wouldn’t be so plain jane like the iPhone, you seen one you seen em all nothing special to it. Not everyone wants the most expensive thing either. I’d like to see that polls you speak of. Because Steve Jobs is a God, and the I-Phone is his gift to humanity. WTF, I-Phone fans are so obnoxious, truth is the current iPhone is far behind in almost every technical specification. The current OS didn’t even come with tabbed browsing, speech to text. It has the mytouch speaker grill ! Is that a 4inch Display? mytouch! With a name like Ruby (ala Emerald) it would make sense. And the speaker “bling” is a dead giveaway to the myTouch line for sure. Hmmmm. Having said that, I went back to tmonews, July 25th, and the speaker grill is not as much of a dead giveaway as I had thought,,, but still quite similar. it’s not a myTouch. ..it doesn’t have that green Genius Button. Already covered this in the first Ruby post. Mytouch 5? (Like iPhone 5?) or possibly G-infinity, name unknown = HTC Ruby. It could still be a mytouch, maybe T-mobile is going away from the Genius Button/Expresso (which isn’t that great). 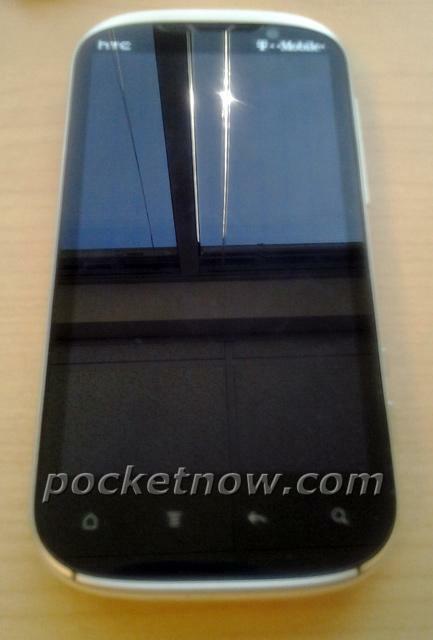 The grill looks exactly like the one from the HTC Panache for Mobilcity (Canadian Mytouch 4g). If this thing has at least a 1 ghz Cortex A8 cpu and a 4inch screen I think it would sell well. It does remind me of my White MyTouch 4g…. a cortex proccesor in a HTC? Why would it have samsungs processor in a HTC device? HTC= Snapdragon’s. Its not a mytouch phone. HTC does make mid range android phones on T-mobile that aren’t mytouch branded, just look at the Wildfire S.
I never understood the appeal of these mid-range and low-end devices. Of course, they’re cheaper. But these smartphone plans are so expensive these days, it doesn’t even seem like it’s worth it to save the $100 when you’re paying at least $60-$70/month (if not more) for at least two years for a plan to use with these phones. Plus, the higher-end phones go on sale all the time, so if you have even a shred of patience, you’re not really saving anything anyway. And all you get is a poorer user experience. These phones usually require only the smaller 200mb data plans to satisfy the in store and mail in rebate. Data plans on “superphones” phones are $20-$30 depending on the voice plan as opposed to lower end devices data plans can be as low as $5. On the new Valueplans T-mobile offers it actually can change a plan total MRC (monthly reoccurring charges) by quite a bit. Even a $20/month savings equates to $480 for two years. You could by your next superphone outright with your savings. Not to argue, But it is amazing how many people say that smartphone web plans are expensive “These Days” when, in actuality a few years ago a standard voice plan cost more than completely unlimited voice text and data plans today. i want to hear some g3 news….stock android ftw! !